Little remains of the art cinema produced in Poland after World War I, and experimental films never had it easy in the interwar period: they were rarely given official releases, or were panned by the press and booed by audiences. Many good ideas simply collapsed due to a lack of funds. Culture.pl looks at the outsiders and visionaries who created some of the most intriguing avant-garde films of the interwar period. Feliks Kuczkowski, also known by the artistic pseudonym of Canis de Canis, may be regarded as the precursor of Polish avant-garde cinema. He began his experimentation in the particularly adverse conditions of imperial-royal Kraków, left destitute by the Great War. In 1917, he ‘dreamed of “colourful symphonies” and even tried to bring them to life amid the misery of war’. His ideas also interested Kraków’s bohemians, such as the expressionist painter brothers Andrzej and Zbigniew Pronaszko, and the writer and film critic Karol Irzykowski. In 1917, he made two short animated grotesques at the Vienna Film Credits Studio: Flirt Krzesełek (editor’s translation: Flirting Chairs) and Każda Luneta Ma Dwa Końce (A Telescope Has Two Ends). In scarcely 38 frames, the former presents the courtship of the titular chairs, with a priest character attempting to interrupt their romance. In the second short, filmed a year later in Warsaw, two carpenter’s rules form Z shapes as they dance with one another, while a plasticine figure and a mask symbolising the audience gyrate around them – masks were Kuczkowski’s creative obsession and figured heavily in his art. Though innovative for the times, Kuczkowski’s films never reached a wider audience. Karol Irzykowski wrote that Canis lacked financial and moral support, since ‘no one in Poland was interested in those days’. Nevertheless, he continued his experiments and regarded his technical shortcomings as his strong point. In 1926, he tried to interest the Berlin studio UFA in his latest film Dyrygent (The Conductor), but although it was well-received, nothing came of it. He eventually set up his own studio in Warsaw – Rarafilm, specialising in advertising and propaganda films that mostly involved puppet animation. 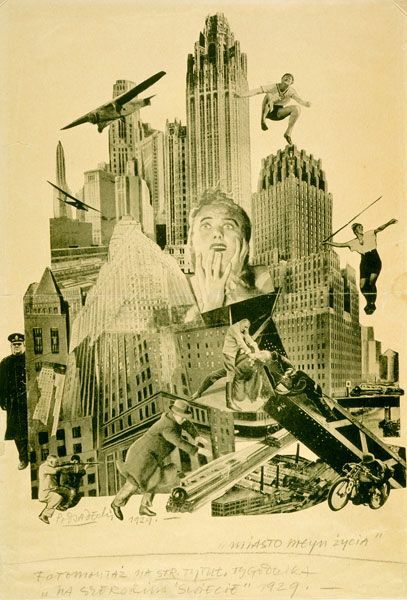 Several years before Fritz Lang’s famed Metropolis (1927), the painter Karol Hiller was reported to have worked on a film which ‘raised almost identical issues, resolving them differently’. Hiller wrote the script and designed the sets for a film entitled A Kiedy Ziemia Ostygnie… (And When the Earth Cools…) in the early 1920s. Unfortunately, no trace of it has ever been found. And that was all, as far as the abortive expressionism in Polish cinema was concerned. Until the early 1930s, Polish avant-garde cinema existed mainly on paper. The press was the frontline of the battle for artistic cinema. For most people, making an independent production was simply unachievable, for technical and financial reasons. The concept of art cinema was chiefly the domain of poets and artists, not film-makers linked to the ‘industry’. To the avant-gardists, the ‘industry’ had sinister connotations, the equivalent of the proverbial freemasons to conspiracy theorists – the embodiment of everything bad about cinema at the time: trivial movies made purely for profit, a flood of foreign trash, incompetently emulated by Polish film-makers. Films were attacked for being too literary and theatrical – cinema was supposed to create new worlds, not duplicate tired models. It was meant to be animate abstract painting or the visual poetry of modernity. There was no real avant-garde film movement, either. It was more of a heterogeneous community of individuals and small groups, often with very little in common. Their common denominator was the struggle to have cinema regarded as an art-form, not merely a lucrative business or lowbrow entertainment. We all had great artistic expectations for silent cinema. In our own way, each of us transferred the poetry of silent cinema into our verse, to some extent. Only cinema can solve the riddle of the latest artistic trends: futurism, cubism, formism and suprematism are far too cramped by the confines of canvas painting. Only through cinema of pure movement (i.e. free of plot, people, horses, trees, locomotives, and other godly and human creations) can their inner passions find release. 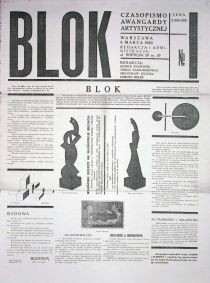 Under the banner of their magazine Blok, the constructivists lobbied for art cinema and published their own concepts for potential productions. One was Mieczysław Szczuka’s 5 Momentów Filmu Abstrakcyjnego (5 Moments of an Abstract Film) – a drawing depicting a sequence of geometric figures, with explanations (various arrows and instructions, such as ‘slowly’, ‘rotation’, etc.) and commentaries like ‘Movement as a change of place: the increase and decrease of unchanging geometric forms’. The whole of my former theory of mechano-facturing […] called for animation, movement, film. Until 1930, avant-garde film was purely theoretical in Poland. Then, a 20-year-old architecture student, Stefan Themerson, and a 23-year-old Academy of Arts student, Franciszka Weinles (soon to become Mrs. Themerson), made the film Apteka (Pharmacy). In order to do so, they used an animation stand of their own design – placing objects on tracing paper and filming stop-frames of their silhouettes from below. These were animated using tricks of the light – moving lamps around above the objects on the stand made their shadows appear to shift and distort. One fine day, a young bespectacled fellow visited me. His face was focused, he had an extremely intelligent look and was of a rather weedy build. He announced that he was something of a poet and was also trying his hand at prose, but his main passion was film. […] I asked my guest how I could be of assistance, and then he said the word: Europa. With the help of his wife, a young artist, the young man wished to make an avant-garde film based on a book I’d produced with Szczuka. Naturally, I accepted the proposal with understandable enthusiasm. In a country that regarded the experimental films of René Clair, Man Ray and Buñuel as ostentatious oddities, receiving such an offer came as a wonderful, refreshing surprise. We discussed the script for the film, then Stefan and Franciszka Themerson brought me their finished version. To be honest, I hardly made any alterations. I was so enthusiastic that I was even unable to assess the Themersons’ work critically. I was well aware of the tribulations faced by modern artists in Poland. I have nurtured and whittled away at this headline for years. It has shone for me during those difficult, dark hours spent in the cinema, comforting me as I choked on the blandness of the intellectual poverty emanating from the Polish screen. To sing images, like a luminous fish does in the dark depths of the ocean, not with a reflected light but with one’s own light. He also criticised the community for grumbling that it lacked funds to implement ideas: ‘Is having no money truly an obstacle to the creation of art? Which came first, the poet or the publisher?’. The Themersons also applied their artistic concepts to educational and commercial films, directing two enthusiastically acclaimed shorts. Zwarcie (Short Circuit), commissioned by the Institute of Social Affairs, warned against being careless with electricity, and its music was composed by Witold Lutosławski. The second film, Drobiazg Melodyjny (editor’s translation: Melodic Trifle), was a three-minute advertisement for Wanda Golińska’s fashion merchandise firm, and marked the Themersons’ first departure from silent film. Objects illuminated using their favourite technique sparkled to the rhythm of Ravel. ‘Crocodile skin glistens, a disgruntled grasshopper cavorts and a crystal vase daydreams lyrically’, enthused the reviewer from Wiadomości Literackie. ‘This trifle of a film is the only wholly, unreservedly positive element in the entire Polish film output of 1933–34’, affirmed Jerzy Toeplitz. There were reports that the short received standing ovations from Warsaw audiences when screened before feature films. The couple’s last pre-war film was Przygoda Człowieka Poczciwego (The Adventure of a Good Citizen) – an ‘irrational humoresque’, as we read from the Gombrowiczian title card. While making a phone call at work, a civil servant (the titular good citizen) accidentally overhears words that were intended for a porter: ‘The skies won’t fall in if you walk backwards’. Taking this line literally, he embarks on an original journey through the city. Soon he is followed by a procession of outraged citizens wielding placards that read ‘The Skies Probably Will Fall In’ and ‘Down With Walking Backwards’. In the final scene, our hero flies up onto a factory chimney and, gazing down at the demonstrators, says: ‘You must understand the metaphor, ladies and gentlemen!’. Some audiences reacted to the film in the same manner as the angry mob, as many screenings elicited booing and stamping of feet. Of the five films the Themersons made before leaving Poland in 1938, this was the only one to have survived. They made two more films in Britain during the war. Calling Mr Smith combined artistic spirit with a propaganda message, urging the English everyman not to be passive to the horrors of the war being waged in Europe. The Eye & The Ear, meanwhile, was an audiovisual experiment that used four songs from Karol Szymanowski’s Słopiewnie (Sprechgesang) in its soundtrack. Kraków was another bastion of avant-garde cinema. Jalu Kurek, a writer connected with Zwrotnica, tirelessly promoted the ideas of art cinema, penning an estimated 500 film-related articles and organising numerous screenings and lectures. His career revolved around film from the very outset. After his high-school diploma, he started to write reviews for the Kraków newspaper Głos Narodu, believing that ‘it is neither money, women, the masons, nor parliaments that rule the world. Cinema rules it all’. Words lie – but not the eye. In OR, I wish to highlight new possibilities for approaching a vision and for associational editing. I had to fit it into 200 metres [of film – PZ], as I was short of money. But please bear in mind the formal coherence of this short, as seen in the convergence and dynamics of the vectors in the footage, and how metaphor comes through in the editing, etc. This film is not based on ideas or images. My modest technical means (i.e. finances) did not allow for boldness of vision or visual variety. In such circumstances, OR’s uniqueness probably lies in its structure […] and editing. Another poet connected to the Kraków avant-garde, Jan Brzękowski, presented his theories of abstract cinema in a script for an unmade film Kobieta i Koła (A Woman and Circles). Two more artists were also active in Kraków – Kazimierz Podsadecki and Janusz Maria Brzeski. They first pursued their fascination with the tenth muse in photo-montages that made liberal use of stills from Hollywood and Western European films. Brzeski was a proponent of ‘contentless’ (i.e. non-fiction) cinema, as it was known at the time, and made two such films: Przekroje (Sections, 1931) and Beton (Concrete, 1933). All that is known about the first is that it was edited together from ‘various film offcuts’ – probably excerpts of newsreel footage. By moving from photo-montage to film montage, Brzeski had taken a step forward in his quest. The Kraków screening of Przekroje was accompanied by a modernist photography exhibition organised by Brzeski and Podsadecki, the first of its kind in Poland. Its guests included the cream of the avant-garde: Man Ray, Hans Richter and László Moholy-Nagy. Alongside Brzeski’s film, Walter Ruttman’s Berlin – Symfonia Wielkiego Miasta (Berlin: Symphony of a Metropolis, 1927) was also screened. The German director’s work shook up the film world and spawned a trend for so-called urban symphonies. He clearly had a strong influence on Brzeski, who encouraged Polish film-makers to document life in Polish cities: Łódź – Jedna Wielka Fabryka (Łódź – One Big Factory), Warszawa ze Swymi Drapaczami Chmur (Warsaw and its Skyscrapers), Kubistyczna Gdynia (Cubist Gdynia), Górny Śląsk […] Śpiewający Swój Stalowy Hymn o Pracy (Upper Silesia […] Singing its Steel Worker’s Hymn). He also urged them to tackle subjects such as Smoke, Coal, Machine and Oil. Go out and film […] speeding express trains and railway points switching. Show the labyrinth of rails tapering off towards the sentimental horizon, and the railway signals. May the semaphores guide Polish cinema onto a new track. This is an avant-garde film. However, it is not intended for those couple of dozen people who delight in ‘weirdness’, but is understandable to all. Artistic reconstructions of the Themersons’ lost films, as well as an unrealised design by Mieczysław Szczuka, can be seen on the website of the Museum of Modern Art in Warsaw. Marcin Giżycki, Walka o film artystyczny w międzywojennej Polsce, Warsaw 1989.